George Graham Reviews Kenny Smith's "Studebaker"
When one has had it up the gills with the various combinations of pretense, airheaded trendiness, sugar-coated manufactured gloss, soulless crystal-controlled electronic beats, or grungy teenage angst that comprise a good part of today's commercial pop, then it's time to get back to some of the great American music forms. Styles that have survived for generations precisely because they lack the above ingredients, and because new generations of players have kept the music vital while keeping what works. Music that never needs videos. I'm talking about the three great American music forms: jazz, the blues and traditional country music which gave us bluegrass. And this week we have an album in latter category: a fine bluegrass recording by a up-and-coming player who reminds us that this venerable music form is alive and well, as if hundreds of thousands of bluegrass fans needed any reminding. 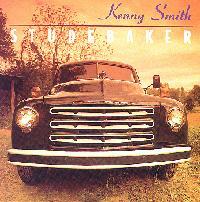 It's the debut by guitarist Kenny Smith, entitled Studebaker. I bring all of this up because I because of the way I happened to hear this CD for the first time. It was one of those days during which, in my job of auditioning music for the radio, I was working my way through a stack of particularly dreary newly-arrived CDs in various styles, almost all of which seemed full of the same trendy but dumb clichés with annoying drums loops and samples, or alternative bands who all sound absolutely identical each other with none seeming to have bothered to learn how to play their instruments, or schlocky pop that has all the musical substance of cotton candy -- in short a cross-section of the commercial music scene these days. So when Kenny Smith's CD came up in the stack, it definitely was a breath of fresh air. Of course, there's a lot of very good bluegrass, or its jazzy offshoot "New Acoustic Music" around, with artists like Alison Krauss and Union Station, whose album we reviewed on this series a few months ago, Tim O'Brien, Chesapeake, Tony Rice and even Béla Fleck when he plays acoustically. And of course, there are legions of bluegrass fans who follow the music intensely. But the particular context of how I came to Kenny Smith's CD got me thinking of what a genuine alternative bluegrass can be to contemporary commercial pop, including so-called "alternative" music as well as the output from the Nashville. Studebaker has everything that makes good bluegrass so appealing: honesty and a complete lack of pretense, superb musicianship, a combination of classic elements of the style with some new ideas that avoid the bluegrass platitudes, and probably the most notable element what marks the best of the New Acoustic scene and sets this CD apart, an extraordinary sense of good taste. Though this is Kenny Smith's debut CD under his own name, he has recorded as a member of the Lonesome River Band, one of the up-and-coming names on the bluegrass scene. His Lonesome River Band-mates also appear on Studebaker, but there are also other guests. This is a mostly instrumental CD, though Smith is no slouch as a singer. In fact, Smith, Ronnie Bowman and Don Rigsby of the Lonesome River Band were enlisted by John Fogerty to sing backing vocals on his recent CD Blue Moon Swamp. Also appearing on Studebaker are Smith's wife Amanda among the vocalists, bassist Barry Bales and mandolinist Adam Steffney of Alison Krauss' Union Station and the other Lonesome River Band member Sammy Shelor on banjo. This is one of those albums on which everything seems to work just right: the playing is excellent, the material is varied and interesting, and the group concentrates on tasteful musicianship usually at easy-going medium tempos, instead of trying to do a bluegrass speed-picking shootout. When they do include a bluegrass standard or two, Smith and company usually take an approach that gives it a fresh sound. As a guitarist, Smith proves himself to be in the league with some of today finest bluegrass pickers like Tony Rice, Dan Crary or Scott Nygaard. He's got a great clear acoustic guitar tone and an excellent sense of ensemble playing, as jazz musicians would say, adding much to the group sound even when he is not in the solo spotlight. Guitarist Kenny Smith's new album Studebaker is a fine example of the best in bluegrass today. Smith and his colleagues from his own regular group the Lonesome River Band and from Alison Krauss' Union Station, are more rooted in the traditional styles than many in the jazzier New Acoustic Music scene, but give their music a fresh sound through their nice arrangements, unexpectedly easy-going tempos and exceptionally tasteful playing. The vocal performances by Smith and his wife Amanda are also first-rate, capturing the soulful side of the style. In short, it's everything a contemporary bluegrass album should be. Smith produced Studebaker himself, and did a fine job. Sonically, the album, engineered and mixed by Ron Freeland, is also first-rate with the recording capturing the warmth and dynamics of the acoustic instruments. The only drawback is the CD's short 35-minute playing time, despite containing twelve separate tracks. To me, this album can have two audiences. One, the long-time bluegrass fan will find Smith and friends' picking to be among the finest the genre has to offer. And I also think, like my own experience in listening to Studebaker after a load of commercial pop, this album can be a breath of fresh air, and a reminder of -- or even perhaps a excellent introduction of a new generation to -- the joys of one of the great American music forms. It's acoustic music played without the aid of videos, that relies on good old-fashioned musicianship, honesty and good taste.